While US prostate cancer rates overall have stayed about the same over a decade, cases of the advanced and most deadly types of prostate cancers have steadily grown, finds a new study that highlights the need to focus on prevention. The study was published in Prostate Cancer and Prostatic Diseases. AICR’s recent report on prostate cancer found that being overweight or obese increases men’s risk for advanced cancers. Yesterday’s study found that new cases of men diagnosed with metastatic prostate cancer rose 72 percent from 2004 to 2013. Metastatic cancers means they have spread beyond the prostate (or other site). These advanced cancers are often aggressive and deadly. Data Source: AB Weiner et al. Prostate Cancer and Prostatic Diseases (2016). Researchers used data from the National Cancer Data Base to identify men diagnosed with prostate cancer. The analysis included the almost 1,100 healthcare facilities that gave prostate cancer patient data annually during the study period. The study did not look at national incidence rates, which gives a clearer view of incidence trends based on population. Out of the 767,550 men diagnosed with prostate cancer during the decade, 3 percent were diagnosed with cancers that had metastasized. 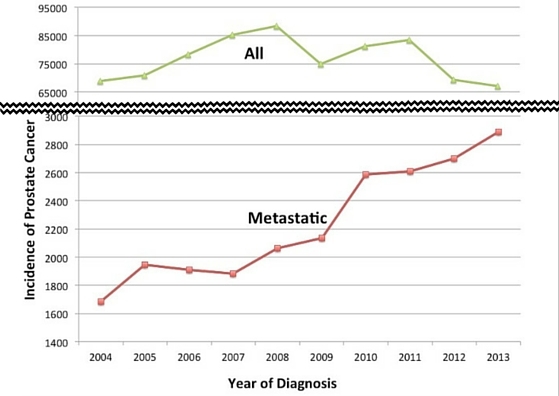 The increase in metastatic prostate cancer was found in all age groups. The largest increase was seen among men ages 55 to 69. In this group, metastatic prostate cancer rose from 702 new cases in 2004 to 1,345 in 2013 — an increase of 92 percent. Of note, the National Cancer data collects information on approximately 70% of all new cancer cases in the US. Because this study did not look at national incidence, the growth could be due to an aging population. But it is likely these trends follow national patterns, the authors write. In the paper, the Northwestern University authors discuss how reduced PSA screenings may have some role in these rising numbers of advanced cases. The Preventive Services Task Force (USPSTF) changed their screening recommendations in 2008 and 2012. Yet as they point out, these findings cannot be explained by the USPSTF recommendations alone, as increases in metastatic prostate cancer began years before the new recommendations. An estimated 11% of US prostate cancers could be prevented if men were a healthy weight. Today, about 7 of every ten U.S. men are overweight or obese, placing them at increased risk for developing advanced prostate cancer. 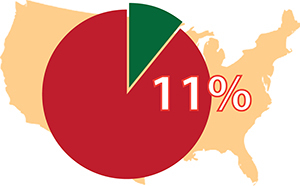 If all men in the US were a healthy weight, AICR estimates that 11 percent of advanced prostate cancer cases could be prevented. Learn more about the risk factors and research on prostate cancer here. The study was supported by grants from National Institutes of Health and the Prostate Cancer Foundation. Update July 21: Experts weigh in on the flaws of the study.